The present volume is a comparative study of the tonal systems of seventeen Sara-Bongo-Bagirmi languages. The Sara-Bongo-Bagirmi languages belong to the group of Central Sudan languages which represent a sub-branch of Nilo-Saharan. The Sara-Bongo-Bagirmi languages are spoken in the Chad, the Central African Republic, the Sudan, and in the Democratic Republic of Congo. They have been only little researched and documented to date. The book is divided into two parts, an analysis of the tonal systems and a corpus containing comparative data. The analysis comprises a general introduction to the languages studied, the sources they are documented in, a description of consonantal correspondences, and the detailed analysis of the tonal correspondences between the seventeen languages and their historical interpretations. 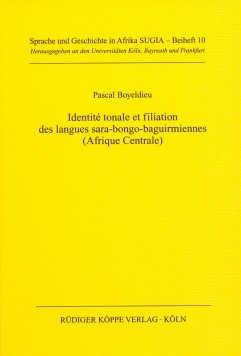 Based on his analysis of the tonal correspondences in the seventeen languages the author reconstructs a tonal proto-system consisting of two tones, from which the various systems of the Sara-Bongo-Bagirmi languages developed, which are classifiable as systems with two, three, and four tones. The different tonal developments within the verbal and nominal systems are of special interest in this context. Among the various systematic innovations observable within the tonal systems of the Sara-Bongo-Bagirmi languages, the development of a third tone in the western-most languages leads the author to reconstruct the origin of the Sara-Bongo-Bagirmi languages in south-western Sudan, and to trace their further geographical spread. Therefore, besides giving a description of the tonal system of the Sara-Bongo-Bagirmi languages, the present study helps to shed some earer light on the overall historical development of these languages.